Modern bibles often insert short little "snip-its" of descriptions within the actual biblical text. For example, consider Matthew 9:9-17. In an updated 2011 edition of the ESV bible, published by Crossway, the words "Jesus Calls Matthew" are inserted directly above the text of Matthew 9:9. The next time a description is inserted, it's above Matthew 9:14, and it says, "A Question About Fasting." Although insertions like these may possibly give someone the impression that Matthew wrote those words too, that's actually not what concerns me. What concerns me about those "snip-it" descriptions is that they definitely do give the impression that Matthew inserted two distinctive units into this portion of chapter nine. Now, as I have noted in an earlier post, chapters 8 & 9 of Matthew were written with an intentional structure, and Matthew 9:9-17 is very clearly one distinctive unit, not two. And because it is was written as one unit in mind, there is a reason for why it begins and ends the way it does. There is a good reason for why 9:9-17 begins with Jesus calling Matthew and why it ends with patching up torn garments and filling up wineskins. Those were not random details. They were historical and purposeful details. Below are two comparisons of the same biblical text. The first is a duplicate of the ESV translation of 9:9-17 as noted above, and the second is the same text, only it's presented as Matthew structured it. And just as you will notice, I have included "snip-its" of description exactly as they are found in the ESV and I have also included my own descriptions within the second translation; but my "snip-its" are not supposed to divide the text (as the ESV appears to have done). My snip-its are there to clarify what ordinarily seems to be a chaotic organization of Matthew's story. 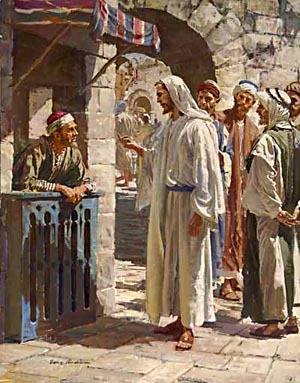 As Jesus passed on from there, he saw a man called Matthew sitting at the tax booth, and he said to him, "Follow me." And he rose and followed him. And as he reclined at table in the house, behold, many tax collectors and sinners came and were reclining with Jesus and his disciples. And when the Pharisees saw this, they said to his disciples, "Why does your teacher eat with tax collectors and sinners?" But when he heard it, he said, "Those who are well have no need of a physician, but those who are sick. Go and learn what this means, 'I desire mercy, and not sacrifice.' For I came not to call the righteous, but sinners. 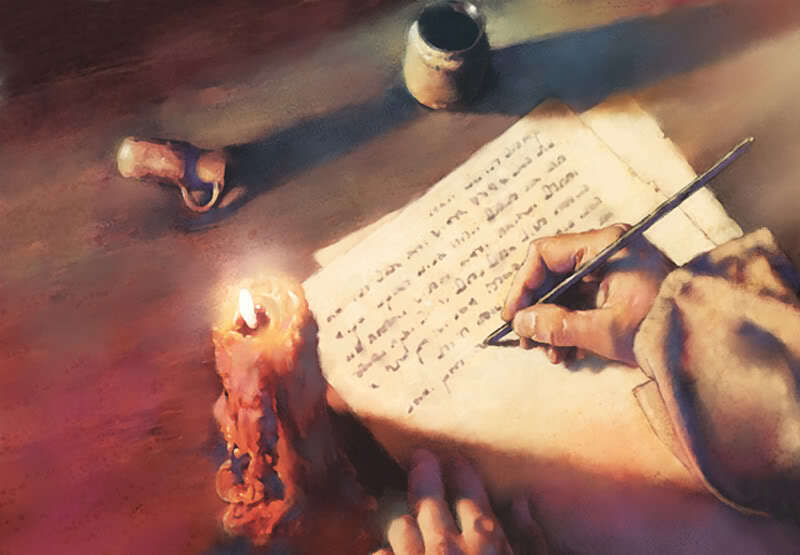 Then the disciples of John came to him, saying, "Why do we and the Pharisees fast, but your disciples do not fast?" And Jesus said to them, "Can the wedding guests mourn as long as the groom is with them? The days will come when the groom is taken away from them, and then they will fast. No one puts a piece of unshrunk cloth on an old garment, for the patch tears away from the garment, and a worse tear is made. Neither is new wine put into old wineskins. If it is, the skins burst and the wine is spilled and the skins are destroyed. But new wine is put into fresh wineskins, and so both are preserved." As Jesus passed on from there, he saw a man called Matthew sitting at the tax booth, and he said to him, “Follow me.” And he rose and followed him. And as Jesus reclined at table in the house, behold, many tax collectors and sinners came and were reclining with Jesus and his disciples. B) but those who are sick. B) as long as the groom is with them? A’) and then they will fast. E) and a worse tear results. C’) Neither is new wine put into old wineskins. E’) and the skins are destroyed. F) But new wine is put into fresh wineskins, and so both are preserved. The prologue is what introduces the background of table fellowship between Jesus some potential disciples within Matthew's home: the "tax collectors and sinners." The two following confrontations (in the center) are also supposed to be illustrations of potential disciples within Matthew's home, but Matthew portrays them as thought they're not really interested in becoming disciples of Jesus. If they were, they would be feasting with "tax collectors and sinners." Instead, Matthew portrays them as disciples who have come into his home to disrupt table fellowship. They're in Matthew's home not to feast, but to fast, and to question the appropriateness of this great feast. It is only after Jesus and his disciples are challenged by these false disciples that Matthew inserts a brief epilogue that's short and to the point; and it serves a similar purpose as the prologue too. It serves to explain more about the background, more about faithful discipleship, and more about why Jesus and his disciples were gladly feasting with "tax collectors and sinners." No one puts new wine into old wineskins either. That too would be foolish! If you put newly fermenting wine into old wineskins that have already been stretched to the max, they'll explode and you'll lose both the perfectly useful case and the delicious wine inside! Who in their right minds would want to do that? If you care about preserving them both, then show that you care. It's common sense, just like it's common sense that new wine needs to be put into new wineskins. The similar principle also applies to sewing patches together the right way. My disciples are sitting here feasting while you snobbishly bicker about your traditions of fasting; and in doing so, you guys are the ones putting new patches of unshrunk cloth on old, torn clothing; you guys are the ones putting new wine in old wineskins; we are the ones preserving both the new wineskins and the new wine by feasting, not fasting.